Time – it’s a concept that everybody understands differently. But everyone is agreement of one thing: We need more of it. Here's how you can manage your time more effectively. Everybody wants to increase their productivity and work more efficiently. 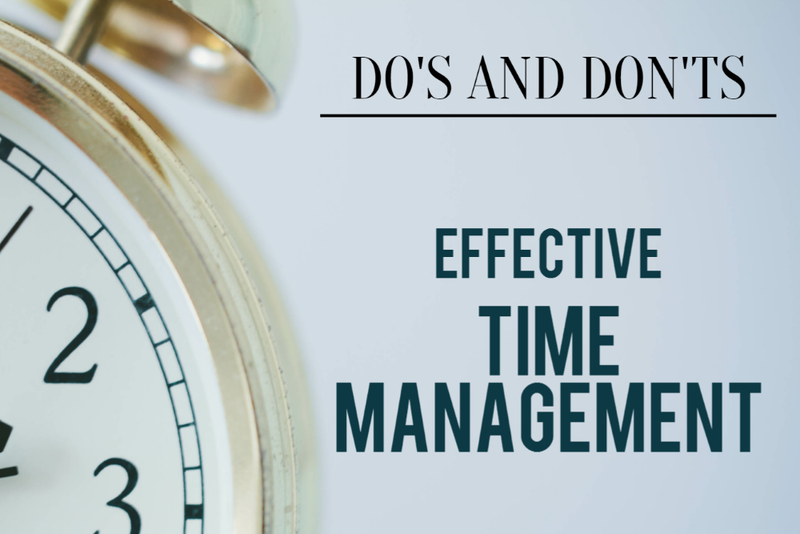 While there is no one-size-fits-all method to time management – everybody needs to find out for themselves which method(s) work best for them – there are certain do’s and don’ts that you can use as a guide to more effective time management. Tracking your time is not just useful to record your billable times, it is also a good method to identify your individual ‘time wasters’. You can do this manually, or use a digital stopwatch to record your working times. By keeping a ‘time diary’ for a week or two, you help will quickly be able to identify activities you spend too much unnecessary time on and which you can optimize and which you can eliminate. Have you ever stopped and thought about why you do something? Yes, activities such as email, meetings and memos are necessary in business. But do you really need to have two marketing meetings a week, or isn’t it better to directly call the person instead of taking half an hour to formulate an email? Goals are important, because they motivate us to work harder – but only if they are achievable. Setting a realistic goal helps you plan more accurately because you know it’s possible and there is enough time to achieve it. Having an unrealistic goal will only stress you out and you’re wasting precious time to try to achieve the unachievable. There are always tasks that we really don’t want to do, such as going to the dentist. But no matter how much you try to delay it, you will have to go at one point or another. Procrastinating it won’t make it go away and in the end the task might become much bigger and will take up much more time than was initially necessary. Use methods such as the Pareto principle or the Eisenhower matrix to prioritize the most important tasks. We tend to spend too much time on urgent tasks, because well, they’re urgent. But the rule of thumb is: Important tasks are rarely urgent, and urgent tasks are rarely that important. Tasks with the top priorities are those that add value to your work and those tasks are the ones you should concentrate on. It’s important not to say “yes” right away every time someone asks you to do a task. Always assess each task you get and identify whether you have the capacity to do it and whether it’s a priority or not. If you realize that you won’t be able to manage it, be honest and say “no”. It’s important to include buffer times between two tasks. You’ll get a short break and can also use the time to reflect on the previous task and prepare for the next. Buffer times also enable you to be more flexible, if something unforeseen happens and a task might take longer to finish than planned, your whole schedule won’t be thrown off course. People often feel as if they’re maximizing their time by multitasking, you’re doing several tasks at the same time after all. Wrong! While it’s true that you’re doing multiple tasks at once, you risk not being able to finish any of these tasks. It’s better to focus on one task after another. BONUS DO: Get enough sleep! You might feel like sleeping is a waste of time, but it’s important to get enough quality sleep to get things done. A lack of sleep has a huge impact on your productivity as you won’t be able to concentrate on your tasks and as a result it will take much longer to finish them. Do’s and Don’ts: How to Improve Your Time Management - InLoox • Copyright 1999-2019 © InLoox, Inc. All rights reserved.